Warm up your winter with a steamy shower, designed just for you. 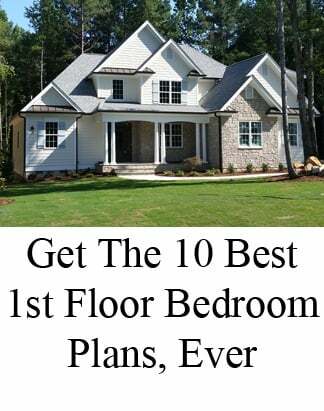 Start with these 14 custom shower ideas, with some of the freshest new ways to create your own relaxing atmosphere - sumptuous saunas, music and lights, multiple spigots, built-in benches, tucked in cubbies, designer mosaic - a water fest in photos! A soothing pebble river rock effect leads to this tub for two and custom shower idea. Natural-hue textures reflect the landscape outside, with an interesting tile arrangement from floor to ceiling that completes the framework for this Raleigh custom home builder specially designed retreat. Pop! 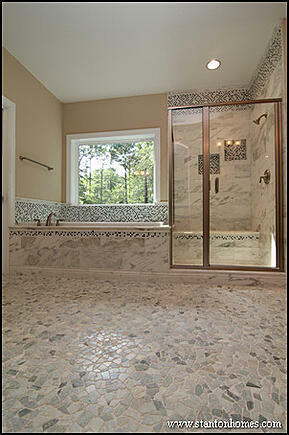 Combine shapes, colors and textures to emphasize the extras that make this custom shower idea dramatic. The built in bench and lots of looking room will make you long to linger. 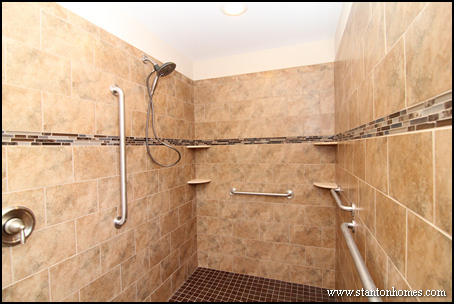 Extra space, wider entry, special grab bars and a built-in bench create comfort in this oversized shower designed for the future, with aging-in-place elements and a feeling of warmth that extends throughout the entire room. 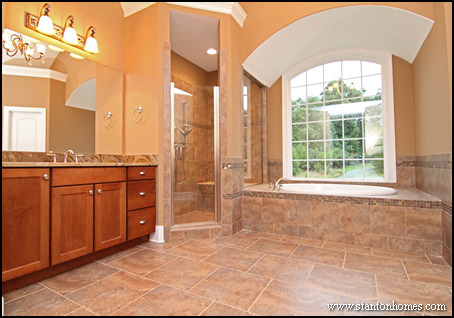 Spice up big tiles with soothing tan tones by adding smaller tiles on the shower floor and tie it all together with a trace of trim. This tucked-in corner custom shower idea serves as a backdrop to the romance of a stand-alone tub. Step inside for a bit of privacy topped by a bench seat and built in cubbies that add up to a feeling of surprising spaciousness from this Raleigh custom builder. The consummate master suite bathroom is topped with a ThermaSol Steamshower System, that turns your ordinary shower into a steamroom, for a hot steam sensation that melts your day away. This version comes with touch access to mood making music and lights, for the ultimate in extras. 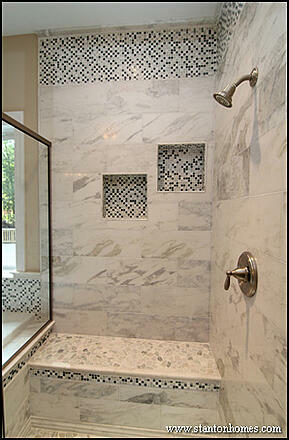 Water and walls are just the beginning of your custom shower ideas from Raleigh custom builders. Dual shower heads and luxury spray adjustments can elevate your experience, like how many elements you can control inside this sauna. Here's a new angle - looking for lots of space but prefer your privacy? 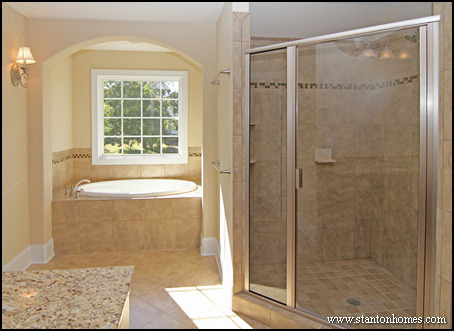 This custom shower idea uses opaque glass to top off the perfect space with a refreshing design and personalization. Color it up! A soaring ceiling and deep forest palette gives this Raleigh custom builder design an artist's reflection, with an angled custom shower idea as the centerpiece for a theme that says, "relax." This dramatic compliation lends Southwest appeal, with a custom designed corner shower that's framed in rich color, big, bold tiles, a built-in bench, and a window to the tub tucked in behind the column. Brash slashes of white add drama to this daring setting. 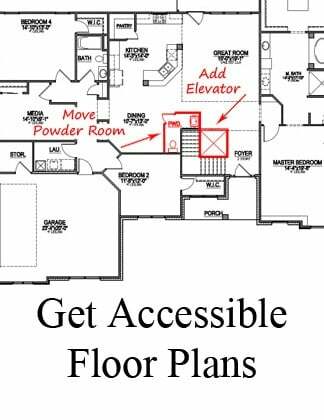 Roll right in to an enormous shower that's a room in itself. 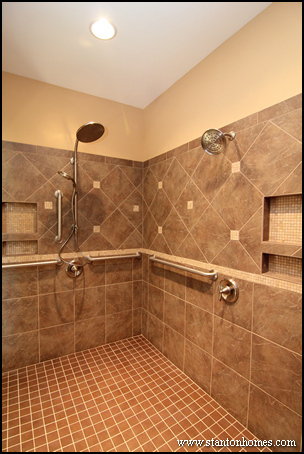 This wheelchair accessible custom shower idea is an amazing experience, from designer tile to lots of lighting, beautiful decor and every convenience. Load up on convenience! 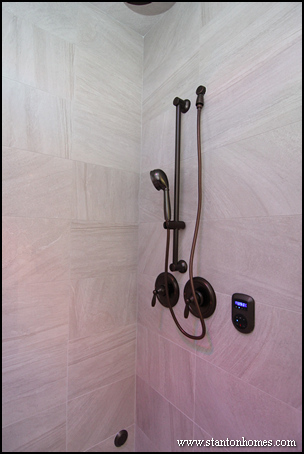 From grab bars to multiple shower heads, tuck-away spaces and easy-to-handle spigots, there's no limit to the customization Raleigh custom builders can create in your shower. 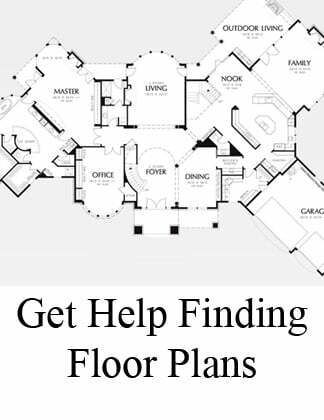 Stretch it out, just for fun, with a high ceiling, huge columns, big bathtub, wide open tile floor and a huge custom shower with dual shower heads. Extensive trim pulls it all together in this classic design with Roman influence. 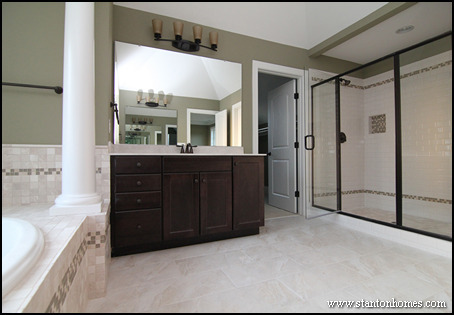 Create personal space that's just right for you, like this custom shower idea that separates spaces with a vanity in the middle. 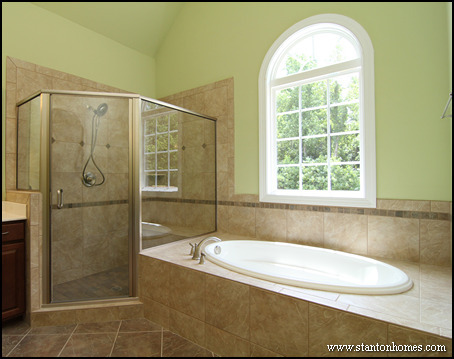 Add a half wall in the shower with glass over the top and an opaque window over the tub for a sense of privacy that allows for natural light flow. 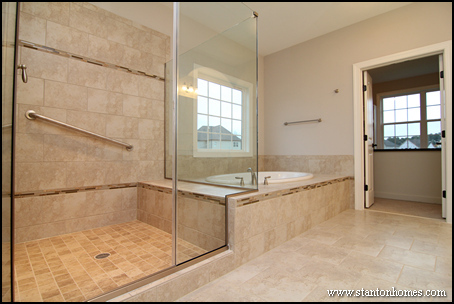 This Raleigh custom home builder angled shower design makes the most of smaller spaces, while putting most of the attention on the garden tub at the center of the room. 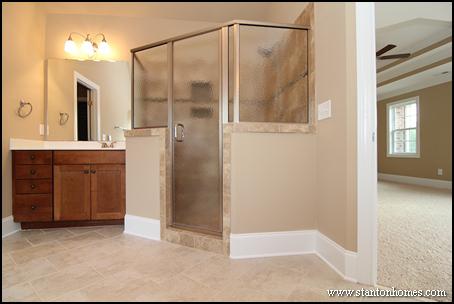 Convenient and practical, this custom shower idea is all about everyday life. 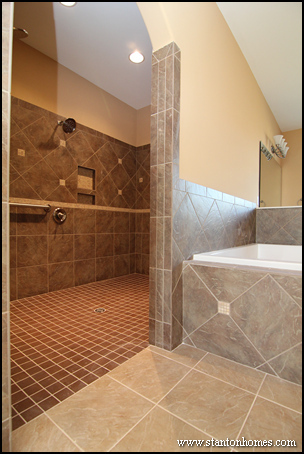 There's a high-end hotel feel to this custom shower idea, with sleek, dark tile accented with a touch of stone. A full glass enclosure gives this open design additional depth. See how the mood can change, when the same type of tile is surrounded by a big ceiling, light floor and a splash of color? 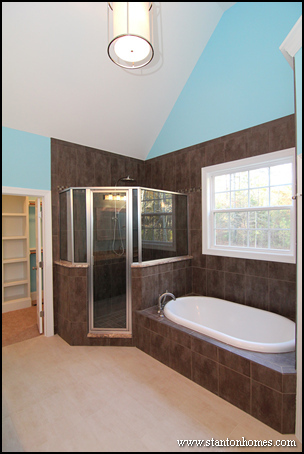 Add a couple of half walls and top it off with a rain shower head and this Raleigh custom builder design has a lot of possibilities. 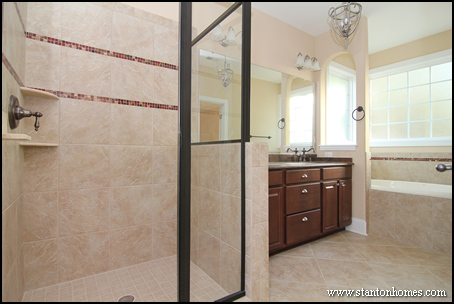 Surround yourself with comfort, in a shower you can grab onto. 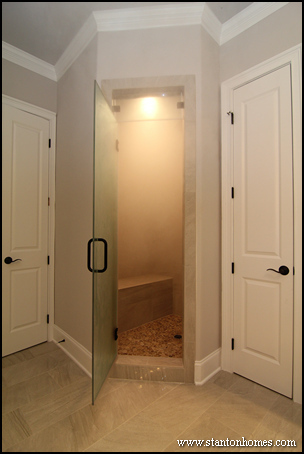 From convenience to pleasure, ask your custom Raleigh builder to design a shower just for you, with an atmosphere that will feel refreshing, every time you step inside.